An interestingly paradoxical trend describes museum quality: The more effort put into engineering the experience, the more invisible the effort becomes. The most clever, intuitive gallery designs match the visitors’ needs, like attentive parents anticipating their children’s demands, precisely so that they may be overlooked. “The goal of the class was to give the students a broad and deep understanding of museum practice, from behind the scenes to front of house,” said instructor Lisa Dorin, who who serves as deputy director of curatorial affairs at the Williams College Museum of Art (WCMA). The course, which took full advantage of the thriving arts scene of the Berkshires, brought students to the Clark Art Institute and MASS MoCA, culminating in a trip to New York City, where students toured galleries and met with museum professionals. The course met primarily at WCMA, which both served a natural pedagogical purpose and achieved an outreach goal of the museum. WCMA already has a robust program for collaboration with faculty, in which Dorin, a curator of contemporary art at the museum, is heavily involved. But the institution is still hoping to become a more central part of student life. “We’re definitely thinking about how the museum can be a hub for students both curricularly, co-curricularly or just a place to come and be,” Dorin said. For Claiming Williams Day last Thursday, the students curated a gallery presentation that reflected the multiple purposes of the modern museum. “We wanted them to come away having created a museum experience so that they’d have an understanding of what it takes to make an experience for the public,” Dorin explained. The presentation engaged with “possible selves: queer foto vernaculars,” which opened in December, and the new exhibition “Collecting History,” a selection of James Van Der Zee’s photos of black New Yorkers from the early 1900s. A dashed line of blue tape led visitors through the rooms and along the walls of art where students’ handwritten commentary, placed on a music stand in front of the relevant art piece, occasionally interrupted forward movement. The students ultimately chose to dig into the ways the highlighted exhibits tackle the complexities of identity; these intimate, personal possessions that are nonetheless profoundly informed by collectivity. “We are curating a project that looks at identifying the self versus the community,” Ben Ward ’22, a student in the course, said. And though this might have been the goal, perhaps the most successful aspect of the presentation was its light touch in answering this question. After all, how can we really draw the line between self and community? The gallery tour ended in the museum’s rotunda. A luminous hall abuzz with activity, it sharply contrasted the solemn mood of the previous room’s post-16th century American and European art. 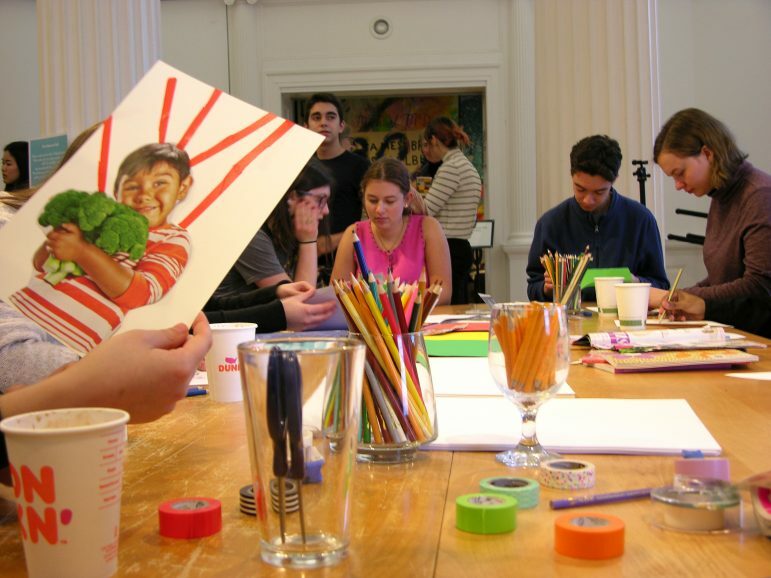 In the center of the columns that ring the circular space, students crafted self-portraits at a table covered in stickers and colored pencils. Another station titled “The External Self” invited visitors to take Polaroid photos of themselves and their friends inside an empty gold frame. Elsewhere, people stood around a table covered in bread (“Come break bread with us in the Rotunda,” a sign in the exhibition invited playfully), munching and writing on sticky notes about bread’s significance in their lives. To the side performed a trio of student string players. Everything in the room was set up to celebrate individuality – visually, aurally and verbally. But the most touching departure it took from typical curatorial design, which traditionally honors the relationship of the individual to the art, was in the community space it created. The program spotlighted so much art that is doing important work by asserting and exploring individuality, and this final destination of the blue tape seemed to convey the most profound reason for its importance. All individuality springs from community, but not to merely hang in artistic and intellectual limbo on the wall of a museum. For this kind of art to be effective in making us all more loving and whole, it is to community that it must return.